We’re proud to republish this article about SDO’s very own Tristen Burke’s very first bow kill from the 2010-2011 Ohio deer season. It was originally published on Wired to Hunt’s blog back in February 2011 and we’d like to highlight it now on our new blog site. The article was written by Tristen himself and his dedication in the field truly supports Storm Dog Outdoors basic principles. We’re looking forward to Tristen’s next report from the field. It was January 30, 2011 and there I was, in my stand with about forty-five minutes left in my hunt and only one more week left in the Ohio archery season. 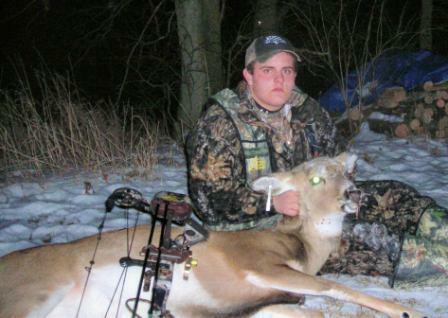 My season started in September 2010 and I’ve been hunting hard ever since. At this point, I had missed two deer this season, one being a 150” class buck we’d been hunting for the last two years. My last three deer seasons have been somewhat disappointing. In November of 2008, I missed a 135” class eleven point at 30 yards, a doe in early 2009 and then in November 2009, I missed another 140” class buck. All of which were captured on video by my dad. As the youngest team Member of Storm Dog Outdoors at 15, I was hunting as hard as I could to do my part and prove myself to the team. I had just finished texting my dad letting him know that I was watching several deer feeding in a cornfield about three hundred yards away. I was thinking there was no way they would ever get close enough for a shot. As I was putting my phone back in my pocket, I looked up and saw six deer crossing the creek one by one heading in my direction. Slowly, they all fed their way around the edge of the field. It seemed like an eternity but within two or three minutes they were within eighty yards. All of a sudden, one of the yearlings made a B line right towards my tree and to my surprise the rest followed. As the does continued towards my stand, I picked the biggest one and I said to myself “that’s the one I’m going to take.” Not long after I thought that, she was about to step into one of my shooting lanes. She was walking left to right as I drew my bow and then I let out a mouth bleat to stop her and she gave me a perfect quartering away shot at twenty-three yards. As soon as I settled my pin on her, I squeezed the trigger on my Scott release and the rest is history. I watched her turn and run as the other deer followed and they disappeared into the woods. Right after I hung up my bow I couldn’t wait to call my dad. He answered “Well?” And I replied “I did it, I just shot one! !” He then excitedly asked me if I hit her good and I simply stated “She’s smoked.” While waiting for him to drive down the road to help me recover the deer, I climbed down and got right on her trail. It wasn’t the complete pass through I had hoped for, but with snow on the ground it was an easy tracking job. I followed her across the field to the tree line where I waited on my dad. Once my dad got there we picked up the trail through the woods and we didn’t need to go far. She only went about 40 yards before piling up next to a fallen tree! This was my first bow kill. I was pumped and as I posed for some pictures, I couldn’t help but think how absolutely awesome this was! I think I was shaking from the moment I released the arrow until I got home that night. Needless to say, this made up for my past experiences in the deer woods. Not to take away from my dad who has put me on some BIG deer which I am very grateful for, but the fact that I was hunting on my own and knowing I did it by myself just makes my first bow kill so much more meaningful. I’m proud of myself for the fact that many people would have given up after being 1 for 5 in the last three years, not to mention still hunting hard in January. I believe that my determination to keep at it after missing multiple deer in a row and having my confidence at an all time low is the reason I was able to harvest this beautiful deer in the first place. I’ve been hunting since I was seven and have harvested several deer with my gun but this one I will never forget!